Design and Build is the way to go! ‘Design & Build’ and the more traditional ‘Design Bid Build’ are two very different delivery methods used in the construction and design industry. With ‘Design & Build’ a client/agent hires a single entity, the designer/builder or Ben Johnson Interiors to perform both design and construction under a single contract. Ben Johnson Interiors works to a fixed price, so with Design & Build, the cost risk remains with us. It may be tempting to think best value can only be gained via the competitive tendering route but this often simply identifies cheapest initial price and not necessarily the best value overall. The traditional ‘Design Bid Build’ involves more consultative fees to write and design the tender and evaluate submissions, often resulting in delays and an uncertain outcome of what is included or not included in the winning bid – with the cost risk remaining with the client. With ‘Design Bid Build’ designers and contractors bear no contractual obligation to one another and the owner bears all risk associated with the completeness of the design documents. Shorter project timescales, simpler contractual arrangements and greater in-house resource from Ben Johnson translates into lower costs and earlier operation of the completed facility. The costs are known far earlier as they are developed alongside the design and value engineering as required to meet a client’s budget. Once the scope of work has been finalised, the project costs are clearly defined and controlled by Ben Johnson Interiors. Single source of accountability. The Design and Build approach provides a single source of accountability for your entire project. The relationship built during the design phase helps to ensure a successful construction project.There is no need to invest time and money coordinating and arbitrating between separate design and construction contracts. The Design and Build approach provides a single source of accountability for your entire project. The relationship built during the design phase helps to ensure a successful construction project. There is no need to invest time and money coordinating and arbitrating between separate design and construction contracts. Design and Build projects can be completed in a far shorter time because bid time is reduced and the design and construction is completed in tandem. Research by RICS (Royal Institute of Chartered Surveyors) found speed of construction was 46% faster with Design and Build than with an alternative procurement method. With single point responsibility lying with Ben Johnson Interiors as Design and Build contractor, this removes any ambiguity that may arise in material and construction specifications. Since designer, engineer and builder are usually all from Ben Johnson Interiors, the focus is always on protecting the client’s interests. Any sub-contractor will always be a long-term strategic partner of Ben Johnson Interiors and totally committed to delivering a quality project. Combining both design and construction services eliminates conflicts that can arise in many areas of project development. All parties are on the same page, allowing fast track schedules and on time deliveries. The advantage of using a single contractor means information is always tightly controlled. For extra reassurance, some clients employ a separate Building Consultant who will ensure that their Design and Build project is always delivered for best value and finished to a satisfactory level of quality. A good example of this would be our work with global orthodontics supplier, TP Orthodontics in Leeds, who appointed Knight Frank to act for them and oversee our costings. You can read the case study of this project here. 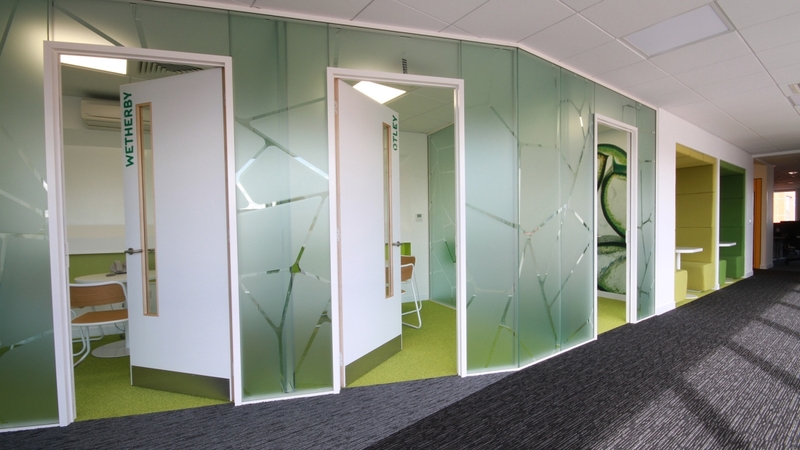 Having successfully completed the refurbishment of TP Orthodontics offices and warehouses, Ben Johnson was then appointed to carry out the refurbishment of the company’s core areas in Fountain House, Leeds. Ben Johnson was the principle contractor on this project and carried out design, fit out and furniture installation. As 30% of the building was sub-let, the design had to be neutral enough to meet the requirements of TP Orthodontics and their existing tenants whilst attracting future tenants.